Wie kam Dr. Cunninghams Leiche in den Fluss? Merkwürdiger kleiner Fall, der neulich nur ziemlich kleine Runden gemacht hat. The body of an employee at the Centers for Disease Control and Prevention who had been missing since February was found in the Chattahoochee River in northwest Atlanta, police announced Thursday. The Atlanta Police Department said in a tweet on Thursday that the body of Dr. Timothy Cunningham had been identified by the Fulton County Medical Examiner's office late Tuesday. Two people found the body while they were fishing and contacted 911, the department said. Cunningham, a commander in the Public Health Service and an epidemiologist at the CDC who worked in public health emergencies like the Zika and Ebola crises, disappeared on February 12 after leaving work, complaining he was not feeling well. Cunningham’s important documents, valuables, and his dog Bo were found at his apartment. During a press conference on Thursday, Fulton County Chief Medical Examiner Dr. Jan Gorniak said there were no signs of foul play. Investigators said that Cunningham likely drowned, though his cause of death had not yet been determined. "We may never be able to tell you how he got into the river," Major Michael O'Connor of the Atlanta Police Department told reporters. 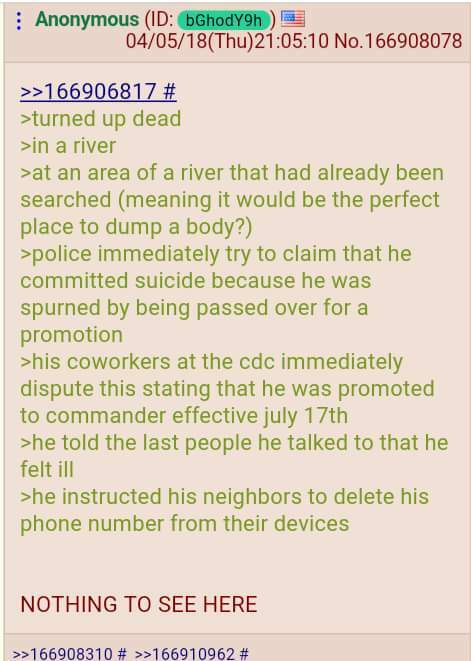 O'Connor said the CDC employee was found by the river wearing his favorite jogging clothes. A toxicology report was still pending. Prior to Cunningham's location, CDC officer Bernadette Burden told Newsweek Tuesday that the CDC wanted him to return to the organization and that his position has not been filled. In a recent statement to Newsweek, Burden said the doctor's friends and colleagues at the center "are deeply saddened to learn of his death." "Tim’s impact will be felt not only through his significant contributions to CDC’s mission but also through his influence on the lives of his colleagues and friends. We extend our condolences to his family and loved ones during this difficult time," said Burden. The search for Cunningham and his safe return has been ongoing since his disappearance. A GoFundMe page raised more than $24,000 to help locate the Harvard graduate, and the reward for information to help in his safe return was raised to $15,000 by the Atlanta Police Department. Der Artikel erschien nen Tag vor dem Fund der Leiche. Mit dem Fund kamen, siehe oben, eigentlich noch mehr ungewöhnliche Umstände auf, aber bezüglich der News hatte sich der Fall damit erledigt. Keine Ahnung ob hier n paar User auf sonderbare Kriminalfälle stehen; dieser hier ist jedenfalls gut genug dokumentiert, als dass man sich bei Bedarf n paar Gedanken machen kann.